Youtube is one of the best and easiest video sharing platform for uploading videos, growing subscribers and monetize your videos to earn money. I think you have already heard many rumors about how peoples are earning a good income from their channel, right? Well, It is true, only if you have a strong base of active subscribers and million views. So, as a beginner, you don’t have to think so far! Now, all you need to do is concentrate on producing useful and attractive videos. Its the only way to be successful on YouTube. 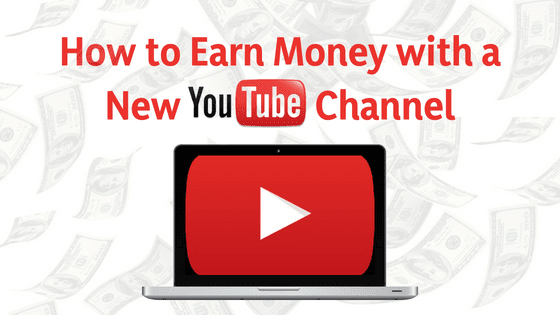 In this post, I will show you the complete guide to start making money on YouTube. Here is the list of 7 necessary steps to start your channel from scratch and make money from it. The first task you need to perform is to start your own channel on YouTube using your Gmail address. After creating your channel, you’ll need to customize the look of your channel by inserting cover image, profile logo, description about your channel and connect your existing website and all of your social media accounts so that views can easily find you on social media directly from your channel. After the creation of your channel, it’s time to upload videos on it. As a beginner, try to produce high-quality videos on a regular basis and use the best video editing tools as you are getting started. By doing this, you channel will be maximumly visible to other new viewers and you’ll start accumulating subscribers. During the time of uploading videos, choose a unique title, write a brief description, use the custom thumbnail and insert all the necessary tags related to your videos. After uploading enough videos, your next task is to grow the subscribers base on your channel and increase views. You can try sharing your videos on different social media sites to get more viewers and embed the videos in your blog and websites as well. Remember that you are not going to get paid for subscribers, you will get paid only when the advertisement appears on your videos while it is being watched by the viewers. So, always try to gain active subscribers rather than building inactive subscribers. You’ll need to activate the monetization feature on your videos in order to earn real cash. By enabling the monetization, your videos will be allowed to serve ads. If you are unaware of new YouTube policies, then let me tell you that you will need at least 1000 subscribers and 4000 hours watch time to apply for Google Adsense advertising program. After performing all the necessary tasks and complete the requirement, it is time to apply for Adsense. In order to sign up, you’ll need to go to the official Adsense website, select your age, provide necessary details such as address, mobile number, your channel, etc. The Adsense application approval process is unpredictable, no one can say, how much exact time they will take to review and approve your URL. For receiving your payments, you will need a bank account, or a Paypal account to collect to earnings. As soon as you have monetized your videos, you will be allowed to analyze how ads are performing on your videos, how much times your videos are being watched, etc on the YouTube Analytics tool. Now once you accumulate a strong base of subscribers, you can enable the YouTube partnership program. It enables popular channels to become a verified YouTube partner and gain access to more advanced tools for customizing and monetizing your videos and get free gifts and full of surprises from YouTube as well.